in spite of the lies we repeat. Poet's Notes: In this poem I chose to analyze a turn of phrase that struck me as rather odd. The mentioning of "one heartbeat" in a political context is somehow medical, actuarial, and even poetic, giving the language an unexpected texture. And for me that inspired a broader contemplation about life and time. I should state for the record that I am not referencing any particular election with this poem. Metaphors are regularly employed in politics, oftentimes as a means of distancing the public from a cold and calculated reality. We talk about putting "boots on the ground" for rhetorical impact, but this also obscures the reality that they're not boots, they're people. They're friends and family members and they are being jeopardized. The risk is not an abstraction and the human element needs to factor into the decision-making process. Politicians use this sort of language quite regularly, from "pork barrel" spending to "grandfather" clauses to "blood and treasure." Even though I am a writer and a strong proponent of creative literature, I wonder sometimes if literal and lengthy and plainspoken language would lead to a more accurate perception of reality, and if that perception in turn would lead to more accurate decisions and solutions. For instance a commentator introducing the aforementioned phrase "one heartbeat away" is actually making a morbid forecast about the President in question, and is perhaps also diminishing the value and influence that the President has left in him or her, which is ageist. But the commentator escapes the flippant implications of saying "he (or she) is old and might drop dead soon," simply by invoking this careful turn of phrase. Perhaps "poetry" can be dangerous in certain contexts. 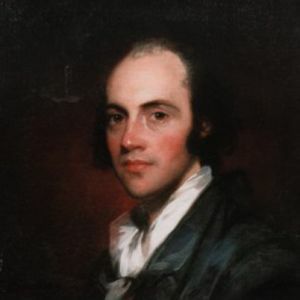 Editor's Note: Vice President Aaron Burr (pictured), infamous for killing Alexander Hamilton in a duel, was "one heartbeat away" from the presidency under Thomas Jefferson. Scary, isn't it?